EM-Tippspiel von Wir helfen Kindern e.V. 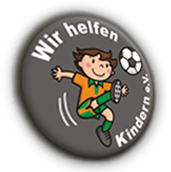 - Mit Fussball Kindern helfen | Hermann Hollmann GmbH & Co.
As enthusiastic soccer fans Hermann Hollmann GmbH and its team have already participated in the betting game on the occasion of the Football World Cup in South Africa for the benefit of „Wir helfen Kindern“. For the 2012 European football championship in Poland and Ukraine there is again a betting game where you can win lots of attractive prices by a donation of 10 Euro to “Wir helfen Kindern e.V.” At the actual phase of the preparation for the EURO championships the organisation looks for sponsors who will be provided by a link to their website in return for a donation. All soccer fans can participate in the EURO 2012 betting game. This year the first price is an Orient cruise with „AIDAblu“ for two persons. All incoming donations will be devided to Parents’ Organization for Children with Cancer in Düsseldorf and Hospice in Salzgitter-Bad. Since 2002 the highly committed initiators of the organisation have been collecting many euros. The incomming donations are exclusively for the work of the recipients and not for the course of the betting game or the provision of the prices for the participants. These can be made to the organisations’ account at the Volksbank BraWo, sort code 26991066, Account No. 1512927000 specifying the purpose „Wir helfen Kindern, EM 2012“ adding donors’ name to be correctly assigned. Here you will find all further “Wir helfen Kindern e.V. EURO 2012 – betting game info and the betting ticket for download! Hermann Hollmann GmbH hopes that you will enjoy “betting for a good cause”!